It’s night 4 of the Winternationals in Tampa, Florida. 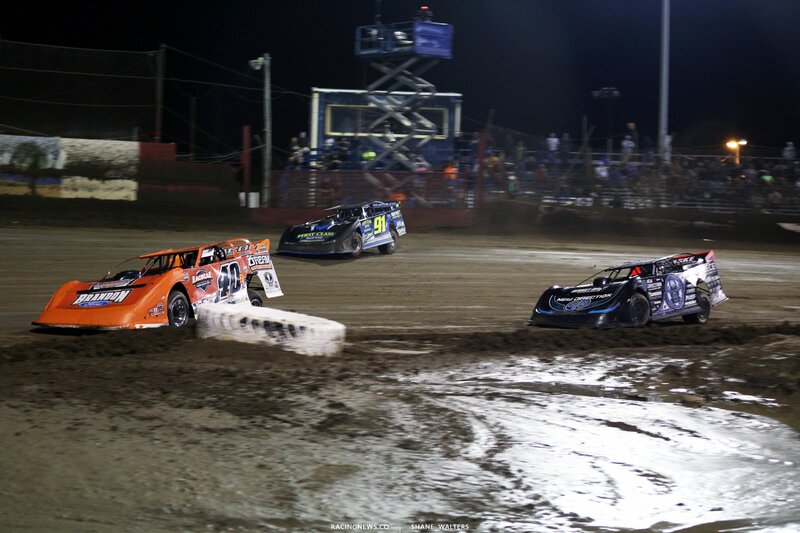 Tonight, the Lucas Oil Late Model Dirt Series drivers fight for a $7,000 payout. It’s the last night before official LOLMDS points races kick in. Boom Briggs and Scott Bloomquist set row 1 in heat 1. Green, Briggs leads by two car lengths into turn 1. Bloomquist makes it all back on the exit. There are a few holes in turn 1. Briggs is jumping them. Bloomquist is taking a much easier entry. 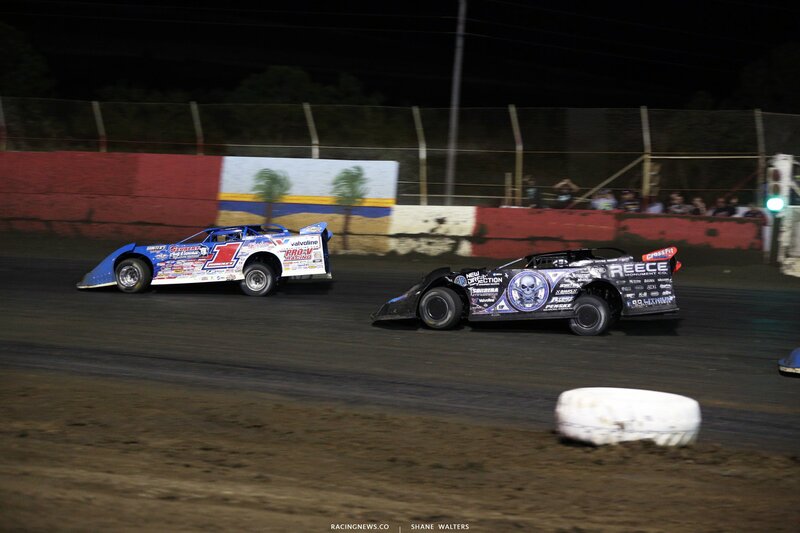 Bloomquist keeps looking low but Briggs outdrives him into the corner. 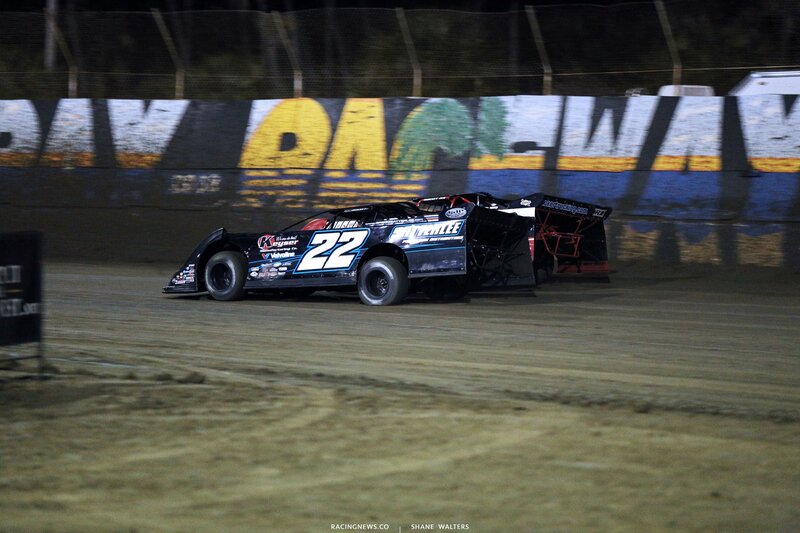 Bloomquist looks high in turn 4. Briggs pulls a slider in turn 1. Bloomquist is around and holds him off to win heat 1. Jimmy Owens and Don O’Neal lead the to the green flag. Green, Owens and O’Neal are side by side into turn 1. Trouble in turn 3! Owens and Sheppard are in the wall. The yellow is out. They get rolling, complete restart. Green, Owens and O’Neal side by side into turn 1. Owens punches it through the center and clears O’Neal on exit. Caution, Tim Dohm is slow. Owens leads. Trouble in turn 4, Sheppard has come to a stop. I think something broke but I’m not sure. Green, Owens drives away from Tyler Erb. Owens wins heat 2. 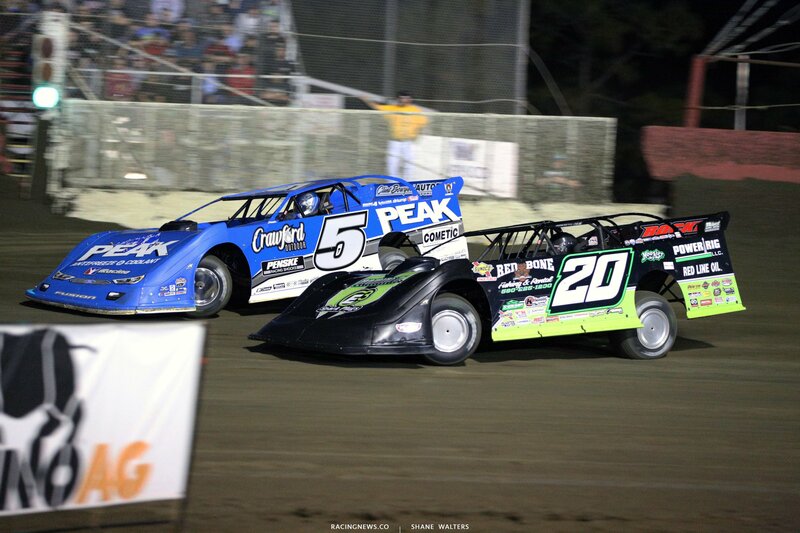 Bobby Pierce and Gregg Satterlee line up behind the pace truck. Green, Moran is tangled in turn 1. He re-fires, this will be a complete restart. Green, Pierce wins the race to turn 1. Satterlee cuts under him on the exit. Satterlee slides him in turn 3 and takes the top spot. Gregg Satterlee wins heat race number three. Kyle Bronson and Jonathan Rowan set the first row in heat two. Green, Bronson is gone. He leaves the field and wins heat race number four. Billy Moyer Jr and Jason Jameson trail the pace truck. Green, Moyer Jr is clear by 2 car lengths into turn 1. The gap is larger in turn 3. The race is for 2nd. Moyer has checked out. Caution is out on lap 9. Ryan King is around in turn 4. Green, Moyer Jr cranks it up and checks out on the field. He wins heat 5. Josh Richards and Dennis Erb Jr lead the field to the green flag in the final heat race of the night. Green, Richards has checkout out. Richards wins by about a straight-away. 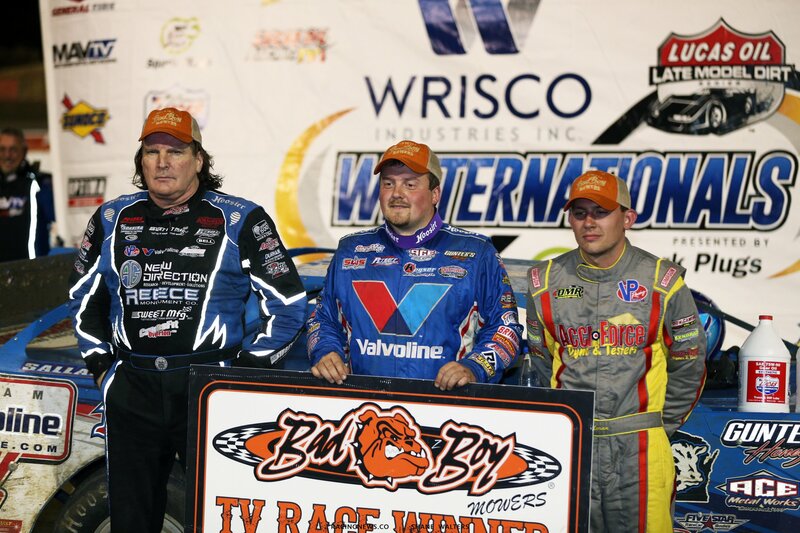 Scott Bloomquist and Kyle Bronson will lead the field to the green flag into tonights 40 lap main event. 4 wide salute, we’re racing! Green, side by side into turn 1. Billy Moyer thought about making it 3 wide, he backed out. Owens takes the lead on the bottom. Lap 2, Bronson has a run on them both. He looks to the inside. 3 wide for the lead in turn 1. Bronson doors Owens, he takes the lead. Lap 3, pile up in turn 3. Hudson O’Neal and two more are involved. Hubbard, Briggs and Hudson O’Neal exit the track. Green, Bloomquist to the bottom in turn 1, he leads off turn two. The caution is out, complete restart. Green, Bronson leads into turn 1. Tyler Erb is flying around the top. He’s around Bloomquist, even with Bronson, new leader. Tyler Erb cuts it to the bottom. Lap 10, caution. Green, Tyler Erb skips it right to the cushion. He’s clear by 3 car lengths out of turn two. 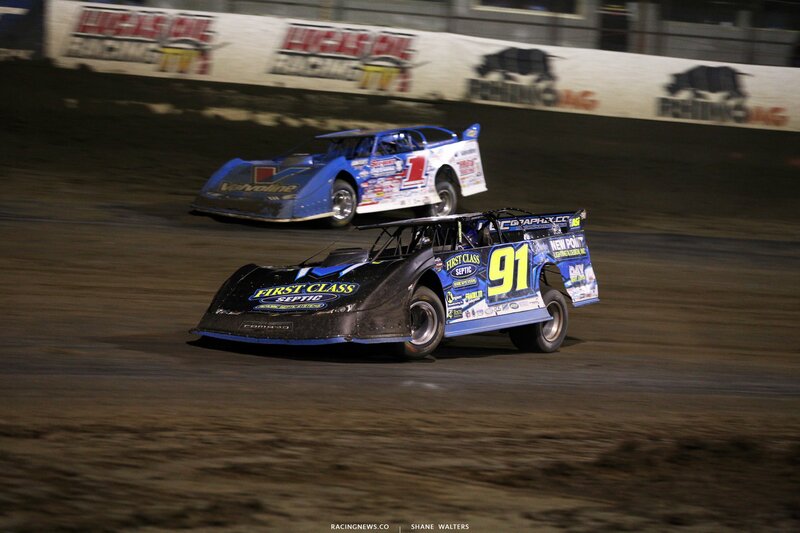 Bronson and Bloomquist fight for 2nd. 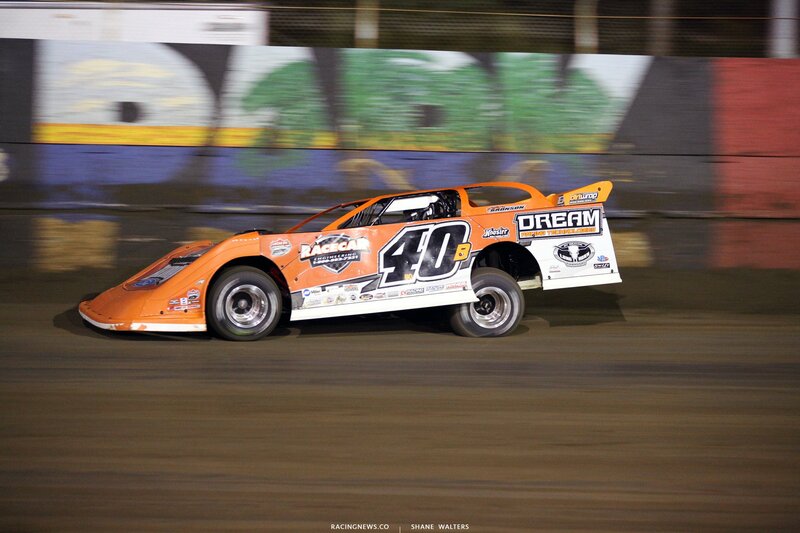 I have yet to see Bloomquist step sideways, it looks like he’s coasting. Saving tires? Meanwhile Owens is fading quickly. They split him high and low. Lap 15, the yellow is out for Don O’Neal, he pulls off. Green, Erb leads. 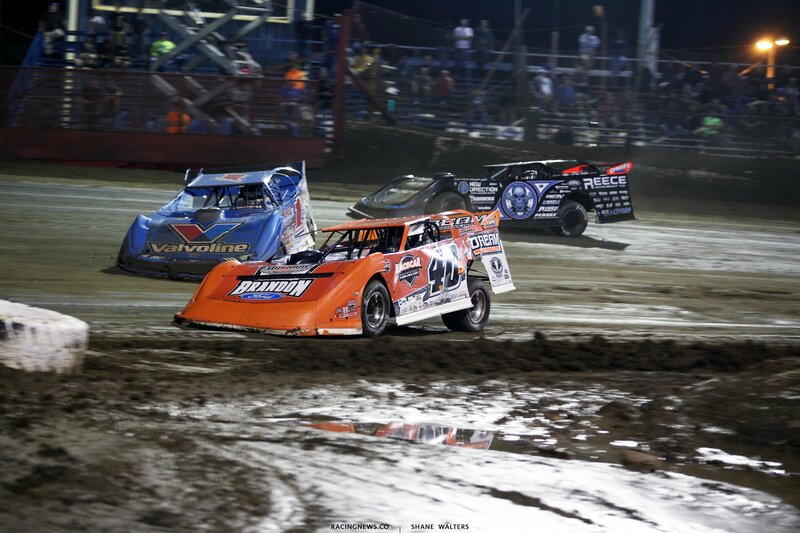 Sheppard splits Bronson and Bloomquist. 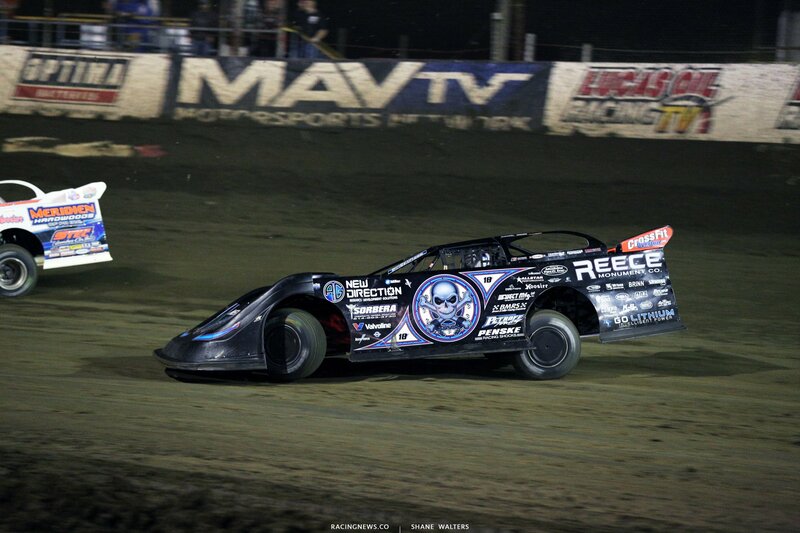 Bloomquist has his wheel turned at the way left, the car goes straight. Not sure if there was contact or if Bloomquist was forced to run over a bump that he didn’t intend to. Sheppard is going. 1st and 2nd run nose to tail on the cushion. Sheppard is there. He dives to the bottom in turn 1. It’s a slider. Sheppard to the lead. Erb wants it back. He’s on his bumper. Erb dives to the bottom. He’s not clear of Sheppard and he leaves a lane. They run door to door off the corner. Lap 23, Tyler Erb jumped the cushion in turn 4. He’s into the wall! He falls the 5th. The caution is out. Green, Sheppard leads. Overton slides Bloomquist in turn 1. But he’s got no drive off the corner. Bloomquist is into his rear bumper. Bloomquist to the bottom in turn 3, he regains 2nd. Overton holds onto 3rd. Lap 32, the caution is out for a wheel cover on track. Green, Sheppard leads but Bloomquist is on his bumper. They’re both bouncing off the cushion. Caution for Brian Shirley, he’s stopped in turn 4. 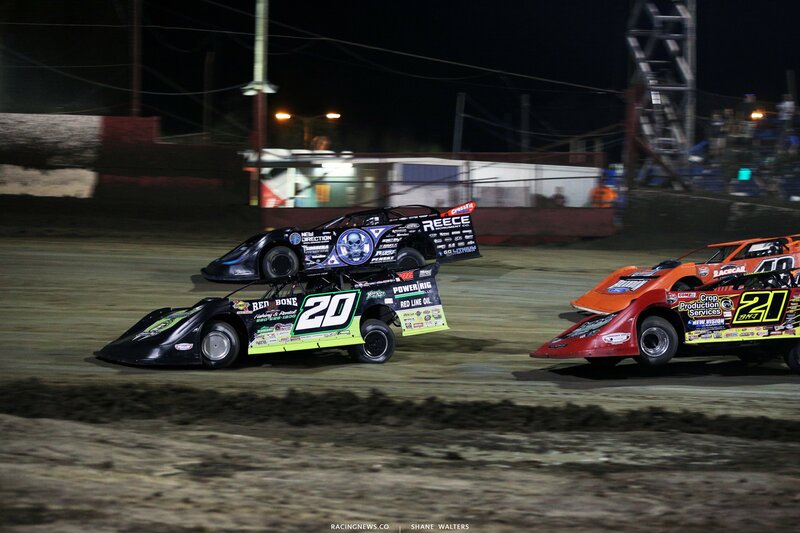 Green, Sheppard and Bloomquist run nose to tail. They’re 3 or 4 wide on the front stretch. Somebody’s nose was lifted 3 feet in the air. I think it was Timothy Culp. No caution. Sheppard has opened up a bit of a gap on Bloomquist. He leads by 2-3 car lengths. 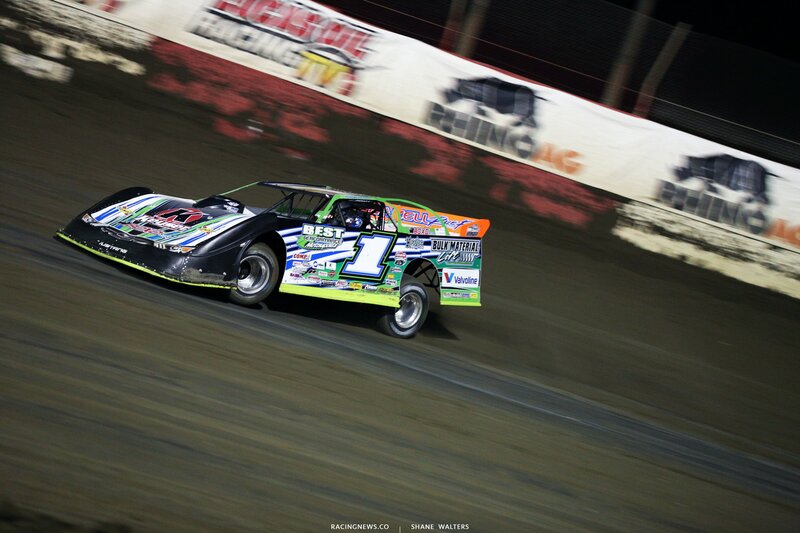 Brandon Sheppard wins at East Bay Raceway Park! Tomorrow night, the main event East Bay Raceway lap count increases to 50. 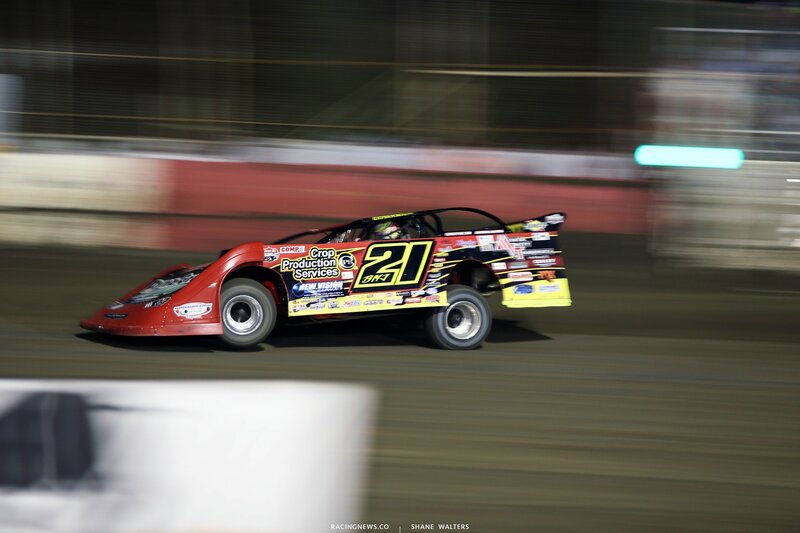 The dirt late model drivers will race for an increased payout of $10,000. View full East Bay Raceway Park results below.